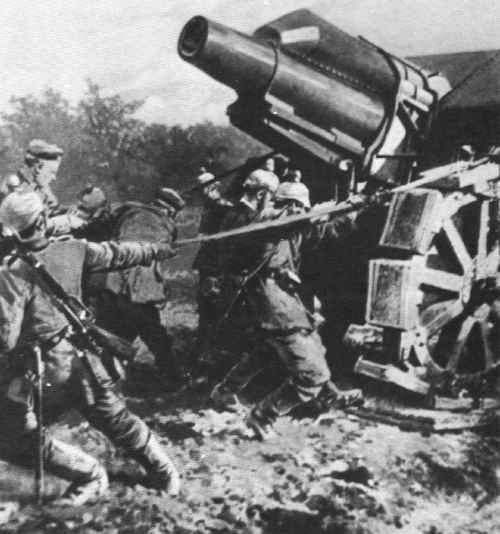 The German advance through Belgium in the summer of 1914, early in the war, demonstrated the value of siege artillery in particular, and all artillery in general. The huge German Krupp 42cm howitzers (Big Berthas) and Austrian Skoda’s pounded the frontier fortresses into submission in only a few day’s time. This lesson was not lost on any of the belligerents, and the race to build and employ bigger and better artillery went into full swing. Let’s review some artillery terminology. There are basically two types of large artillery - the cannon and the howitzer (or mortar). A cannon fires a shell over a long arc and typically hits its target head-on. 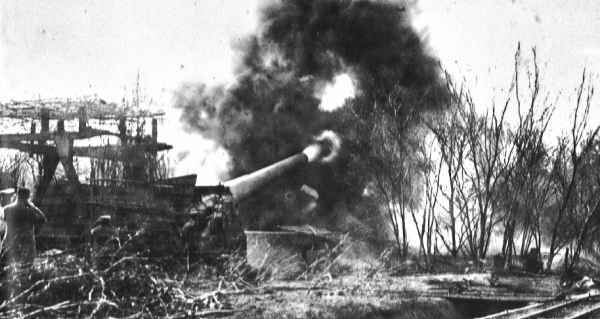 The howitzer (or mortar) lobs the shell over a high arc so it lands atop its target. Your choice of artillery depends upon the job at hand. Large guns, like handguns, are measured in caliber. This is the diameter of the barrel, and roughly, the shell it fires. Sometimes this measurement is given in inches, other times in centimeters or millimeters (thus a 42cm shell equivalent to a 420mm or 16.5 inch shell). The shells on naval ordnance are separate from the powder charge used to propel them (which is contained in a powder sack) whereas with smaller artillery, the powder charge is built into the shell much like a bullet. The advantage to a separate powder charge is that it allows the same shell type to be used over a wide range of distances by varying the charge. 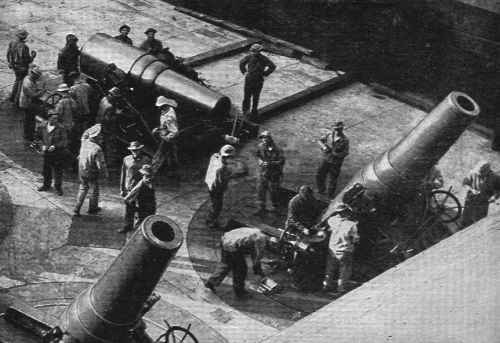 In the Great War, the largest artillery was the naval variety - the guns of the dreadnoughts. These were monster guns for the time, in the 12 to 16 inch class (these would grow larger over the course of the war). These represented powerful and highly accurate produce of the naval arms race and the industrial revolution. The battleship made a perfect platform for guns of such size. After all, what’s a couple of hundred tons when you are dealing with vehicles in the range of 18,000 to 28,000 tons? The water cushion on which the battleship sat also helped absorb the massive recoil generated by these weapons. Even with such high gross weights, many battleships employed lockout mechanisms that prevented two gun turrets from firing at the same time - not as much out of fear of rolling the ship as for the possibility of altering the trajectory of the second salvo by the roll caused by the first. 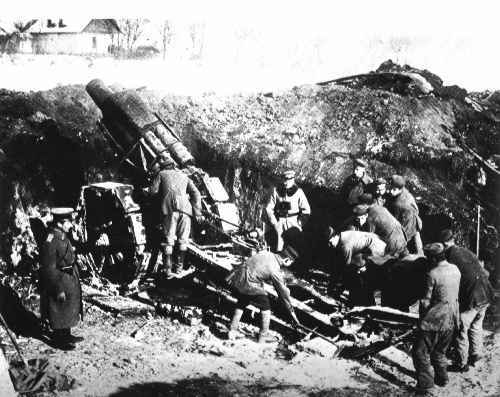 It is interesting to note that several of the large siege guns used against the Belgian fortifications had to be set in concrete before they could be fired due to their massive recoil. Battleships were not an option on the Western Front, but the guns they used were seen as a tool that could help break the stalemate of the trenches - especially when used against the concrete fortified German positions near the Somme and later, the Hindenburg line. The first attempts at employing oversized naval ordnance simply consisted of putting the gun on a wheel mount and attempting to secure it in place. While advanced recoil mechanisms allowed for some success, deployment was still slow and cumbersome. The guns could only be moved slowly by large tractor. A worst case scenario would involve the gun falling into enemy hands in the event of a hasty retreat. Then came the rail gun. Rail presented the perfect transport and firing platform for land based naval ordnance. The gun could be moved relatively quickly along the rail system and the recoil could be dispersed by allowing the carriage to hurtle down the tracks (sometimes up to 100 feet). In some cases, a piece of curved siding was actually used to aim the gun. These guns could fire up to thirty miles and were capable of reaching far into the enemy’s rear positions. 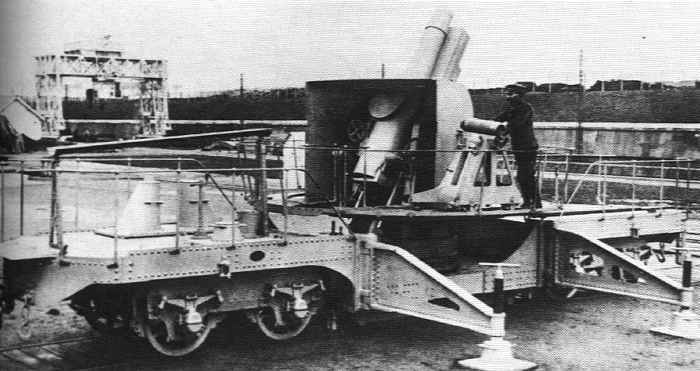 The culmination of the rail gun was the massive French Schneider 520mm howitzer. The shells this gun fired were over 24 inches in diameter and weighed 3,100 pounds. They were fused in such a way as to allow the shell to penetrate its target before detonation. Luckily for all involved, the war ended before they could be brought into service. 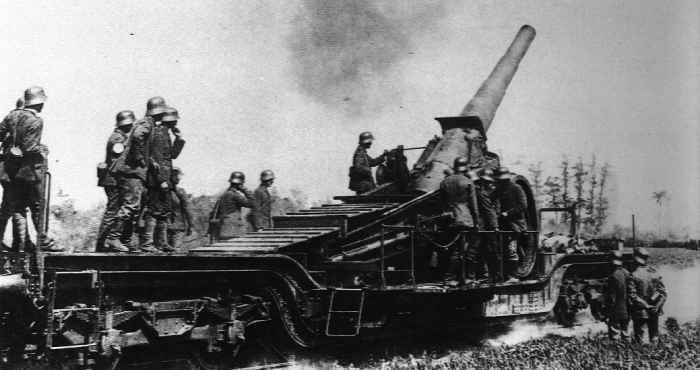 Probably the most discussed of all of the big guns of the Great War is the infamous Paris Gun. Also known as Lange Max (Long Max), Big Bertha (not to be confused with the 42cm Krupp howitzer given the same nick name) and William’s Gun; this gun was strategic, rather than tactical in nature, in that it was a terror weapon meant to demoralize the citizens of Paris. 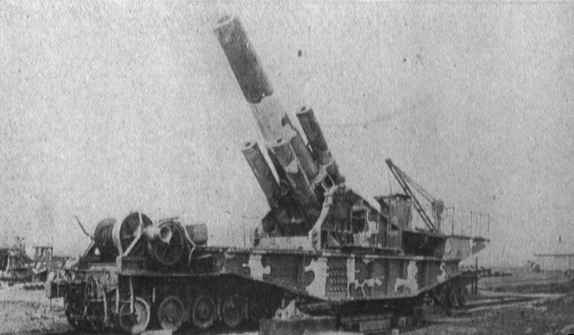 This forerunner to the Iraqi supergun could fire a shell 70 miles in about 170 seconds reaching a maximum altitude of 24 miles - quite a feat of German engineering for 1918. On the down side, the payload was only 15 pounds of explosive, accuracy was non-existent (you could hit Paris but not a specific target in Paris), and the whole gun would have to be rebored after 65 firings. 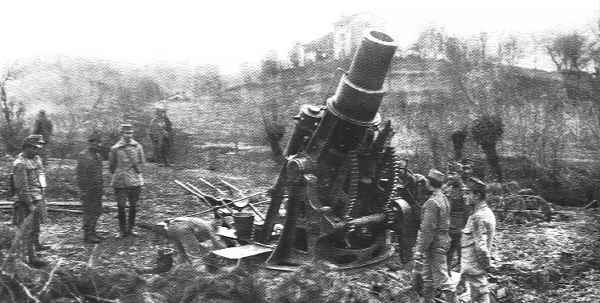 Schneider 520 information from Over There Vol 9 No 4, The Biggest Gun in WWI by Konrad F. Schreier, Jr.
Austrian 30.5cm mortar in action in Galicia. 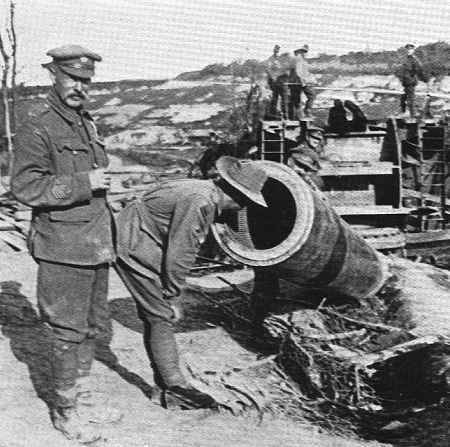 A German 38cm gun fires the first shot at Fort Douaumont in the battle of Verdun. American railroad artillery detachment posed on a 14in. 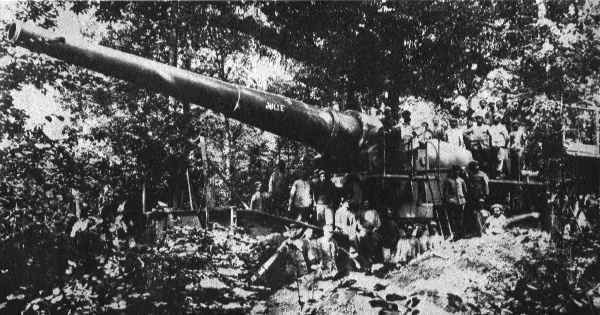 rail gun near Bassons, Gironde, France after the war. American naval ordnance on wheels; a 14in., 30 mile gun. Putting the wraps on a large rail gun. British heavy artillery on the move. This was the alternative to rail transport. Rail gun Julie with her crew in a camouflaged position. 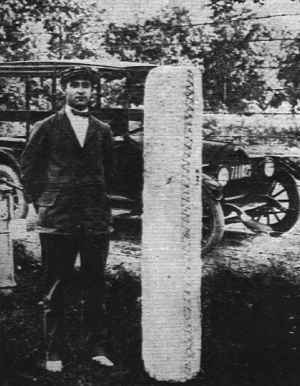 Man posing next to a powder sack used in 16in. guns. 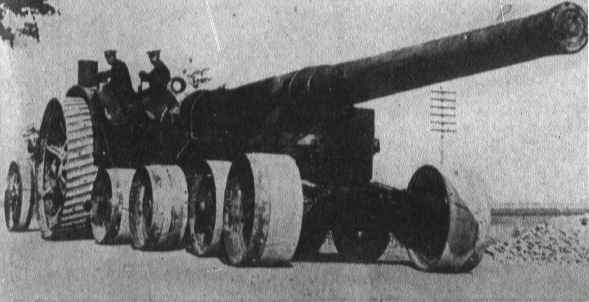 Giant howitzer on a rail mount. 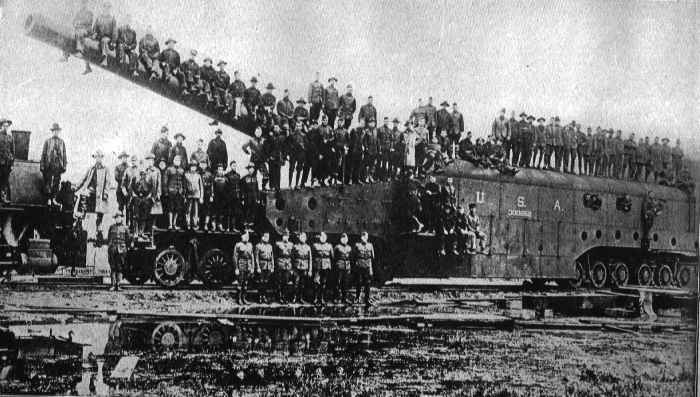 The weight of the mount and gun - 200 tons. 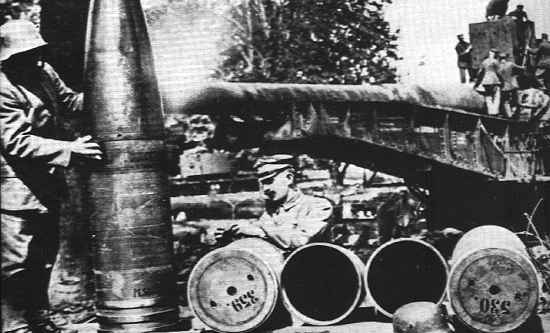 German soldier standing next to a giant rail gun shell. The infamous Paris Gun. This monster had a range of 75 miles but little accuracy. 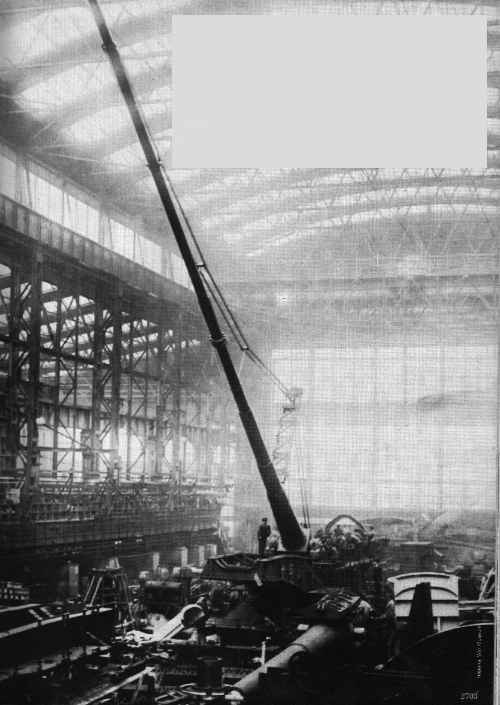 The gun had an overall length of 112 feet (34 meters) and weighed 138 tons. Captured German 15in. 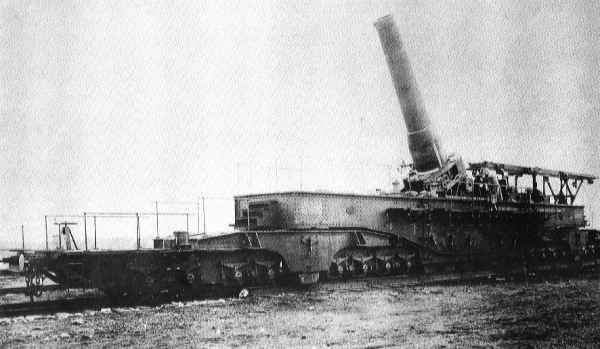 gun of Chuignolles. The gun was 70 feet long, weighed 500 tons and had a range of 24 miles. Schneider Obusiers de 520. 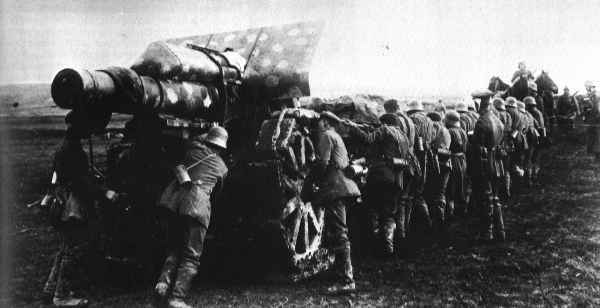 This French 520mm howitzer was the biggest gun of the Great War. It could deliver a 3,100 lb shell (600 lbs of explosive) over 10 miles. The gun car was just under 100 feet long and weighed 290 tons. This photo of the Schneider 520's breech gives you some idea of the size of the shells used. 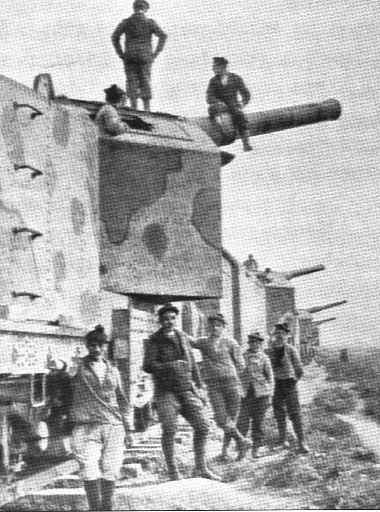 German 17cm gun on rail mount. The recoil would propel the carriage 100 feet down the siding. Huge mortars on the American homefront. Atlantic coastal artillery at Fort DuPont, near Delaware City. A German 21cm howitzer and crew in Rumania, near Sereth. Another shot of a 21cm German howitzer. This one being dragged into position by its crew. 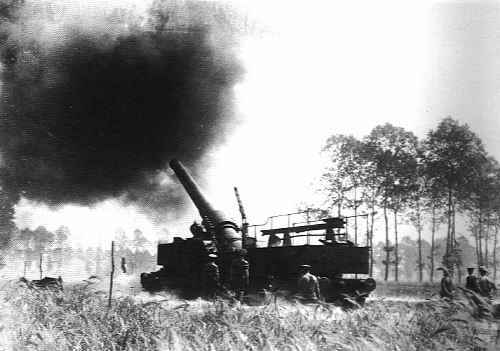 British 12in rail gun in action near the Somme. Early model of a French Schneider howitzer in 1914. 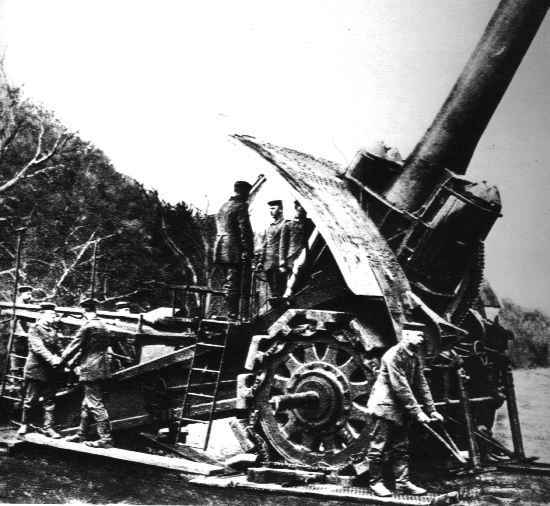 The legendary Krupp's Big Bertha, a German 42cm howitzer of the type used to crush the Belgian fortresses in 1914. 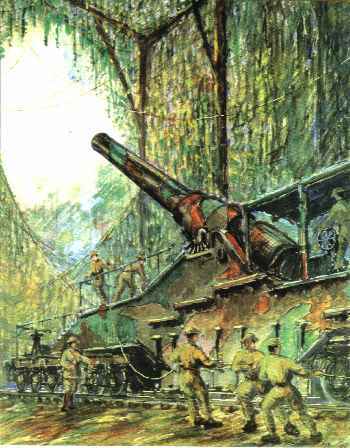 French Marines and an entire train composed of rail artillery. Schlanke Emma (Slim Emma), Austrian 30.5cm howitzer disassembled and ready for transport. 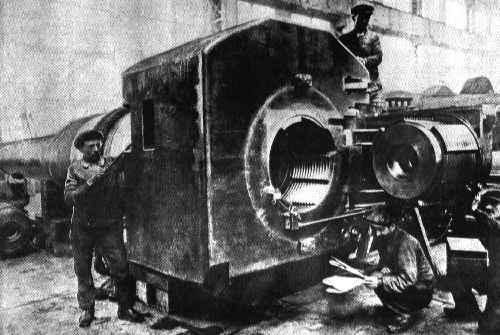 German 21cm morser (heavy morter) being pulled into position.